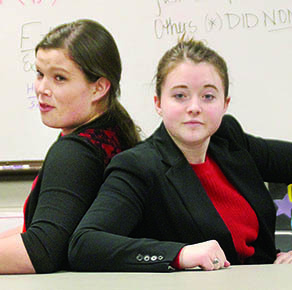 DUET ACTING — Stephanie Wright, l., and Abby Mousel will perform their duet selection in the C1 state tournament this Thursday at Kearney. Scott Wright performs in serious prose at the district meet. 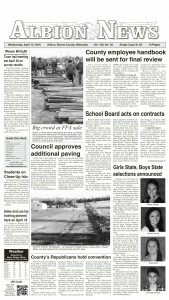 Boone Central has three qualifiers in three events for the C-1 State Speech Meet in Kearney this Thursday, March 21. 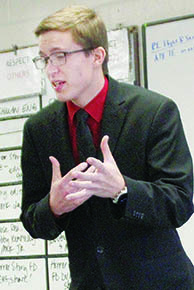 The Cardinal speech team hosted the C1-4 District tournament last Wednesday, March 13, with nine teams participating. Boone Central placed fourth in the team results with 124 points, and scored in seven of the nine events. Senior Scott Wright qualified for state by placing first in serious prose and second in extemporaneous speaking. Abby Mousel and Stephanie Wright earned a ticket to state in duet acting by placed third. Trey Zoucha placed sixth in serious prose and fourth in entertainment speaking. Julia Nore placed sixth in persuasive speech. Rachel Malander finished fourth in extemporaneous speaking and fifth in informative speech. Ashley Mewhirter placed sixth in poetry. Pierce won the team race with 194 points, earning points in seven of the nine events. The Bluejays were strongest in oral interpretation of drama, where they claimed both first and third places, and informative speaking, where they also placed both first and third. Pierce also claimed first place awards in entertainment speaking and extemporaneous speaking. David City Aquinas was second in team results with 180 points. They earned placings in eight of the nine events, with first places in duet acting, humorous prose, poetry and persuasive speaking. Battle Creek, placing third in the team race with 162 points, had no first place individual awards, but earned points in seven events, with 11 individual placings in the top six. At the state meet, Class C1 events will begin at 8:30 a.m. Thursday. Finals are at 3 p.m., with awards at 5 p.m.